Perhaps the best known and most celebrated post-Beatle Paul McCartney album was his 1973 album with his band the Wings. Band on the Run was released 45 years ago today and it featured the famous title track and their hit single “Jet.” It was also McCartney’s last album on The Beatles-founded Apple Records label. McCartney played with the Wings for a decade, releasing seven studio albums and a triple live album. By far, their most successful work was their third LP Band on the Run, and after a mixed reception from their first two albums, this record really was the blockbuster record that McCartney fans were hoping for. On the fourth of July in 1990, McCartney performed a career-spanning set in the nation’s capital in support of his latest solo album Flowers in the Dirt. He performed “Band on the Run” in addition to solo songs and Beatle megahits and deep cuts. The setlist included “Hey Jude,” “Let It Be” and “Eleanor Rigby,” plus new tracks like “Put It There” and “My Brave Face,” the song he co-wrote with Elvis Costello. That night, McCartney played guitar, piano and bass and he was joined by his then-wife Linda McCartney (vocals, keyboards), Robbie McIntosh (guitar, vocals), Hamish Stuart (bass, guitar, vocals), Chris Whitten (drums) and Paul Wickens (keyboards). The Beatles’ concerts were usually met with an unfortunate combination of lackluster P.A. systems and a horde of screaming fans, often resulting in poor audio quality. However, this 1990 McCartney recording is a much more hi-fidelity document of his greatness and celebrated back catalogue. 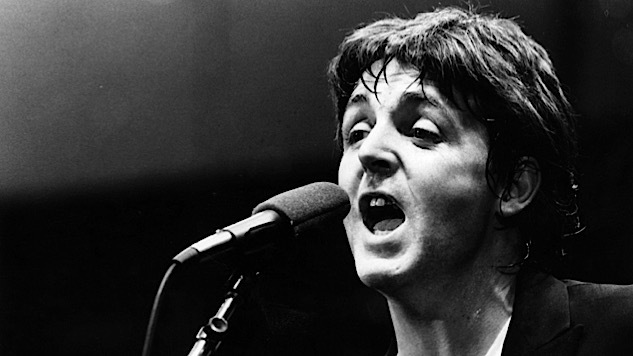 Listen to Paul McCartney perform “Band On The Run” below.